I have been in construction and remodeling my whole life. My years of experience gives Dream Kitchens & Baths an edge when it comes to needed knowledge of the anatomy of a home. We hear all time, the last kitchen company said that can’t be done, we would never tell a client “it can’t be done”, there is always “a way”. This knowledge gives our clients the best job they can get. I have been in the Kitchen and Bath business for 15 years and counting. There is nothing more satisfying than obtaining the goals of the client to achieve the finished project they Dreamed about. My experience covers years of design and managing sales/operations. Outside of work, I love to spend time with my wife and kids, and if there is time in the day, I like to golf. I’ve been designing kitchens and baths since 1986. Styles have changed but the enjoyment I get from my job has not. It’s great when my customers see the finished product and they are so excited and happy. I have worked in the Kitchen & Bath Industry for 12+ years. I enjoy helping customers achieve their goals. I really like helping customers choose design options and selections. In my spare time, I spend time with my husband and our 2 little ones. 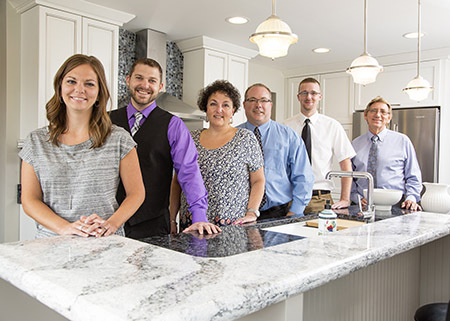 I am proud to be the newest member of the team here at Dream Kitchens and Baths. I have been designing kitchens and baths for about 6 years now. I love watching how a transformation of a space no matter how big or little, simple or complex can be so satisfying to the customer. My goal is complete customer satisfaction along with the rest of the team here at Dream. When not working Josh loves to spend time with his family and also performs in musical theater in the Westmoreland County area.